The possibility of a strike by Los Angeles teachers loomed larger today as the teachers union, UTLA, declared an impasse in negotiations with LA Unified, citing a lack of progress in bargaining since the talks began last year. The district agreed and said it would join the union with “reluctant willingness” in asking the state Public Employment Relations Board to affirm that the talks are deadlocked. The declaration starts a detailed legal process defined by state law, designed to give the sides the best chance to resolve differences. It could take about a month before they exhaust the steps along the way, leading to an agreement or a strike. The sides have made little progress on a dozen issues, including a pay raise for teachers, who haven’t had one in more than seven years. After 18 bargaining sessions, it became apparent today that the gulfs on salaries and everything else are too wide to close without outside help. If the PERB affirms that the talks are deadlocked, a mediator would be assigned to help the sides find common ground and bring them to an agreement. Negotiations can continue during the mediation process, but if it proves unsuccessful, the process would continue with a fact-finding panel — a representative from each side and a state-appointed neutral as chairman — to recommend terms of a settlement. If no agreement is achieved, the sides could resume negotiations, the district could impose its best and final offer and, rejecting it, the union could strike. 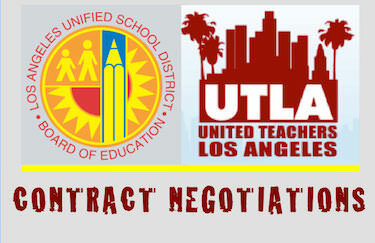 “After 18 bargaining sessions since July, LAUSD has yet to present legitimate counterproposals on key elements of our Schools LA Students Deserve campaign,” the union said in a statement, listing class sizes, due process for housed teachers, support for restorative justice programs and elimination of teacher evaluations among the issues on which progress has been elusive. The union characterized the gaps between as “significant.” As one example, the union is demanding an 8.5 percent one-year increase for teachers while the district’s latest offer is 5 percent, which it described as “fair and generous.” The union rejected that offer last week. The union insists the district can afford to meet its demands, pointing to $59 million in unspent Common Core funding that must be spent by June 30 and an 8 percent increase in state money to the district through Governor Jerry Brown’s budget proposal. The district calculates the cost of meeting the teachers’ demand at more than $800 million, saying that would either bankrupt the district or, by cutting elsewhere, cause layoffs and the elimination of programs. The union has accused the district of “refusing to bargain in good faith” on that and other issues despite, as the union asserts in its statement, LA Unified ranking last among 47 school districts in LA County in maximum teacher salary. The union also cited recent district data that showed about 3,000 classes have over 45 students per teacher.